Sydney Elizabeth Auchinleck was born in York Street, Dublin, on 18 April 1884. She was the eldest of three sisters. It is not clear when but before 1901, the family moved to 7 Harcourt Street, not far from the Royal College of Surgeons and Trinity College, Dublin (TCD). Hugh saw patients in his surgery on the ground floor of the house and taught medical students there. Sydney was educated at the Alexandra College for Girls in Dublin. It was named after its patron, Princess Alexandra of Denmark and took the school colours of red and white from the Danish flag. Ann Jellicoe, whose aim was to further women’s education, founded this Church of Ireland College with the blessing of Archbishop Richard Chevenix Trench. Ann Jellicoe firmly believed that ‘until women were admitted to Trinity College Dublin the voice of women would not commonly be heard in politics, literature or in academic debate’. 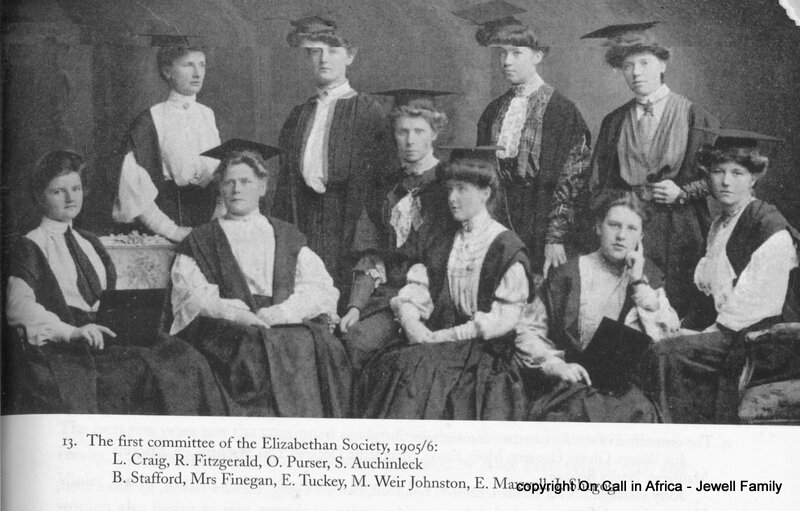 During the final years of campaigning for higher education for women (1892 to 1904) there was strong opposition within conservative Irish society and Trinity College and many fears were expressed by the all-male institution. Women would be a distracting ‘danger to the men’ and, indeed, in danger of damaging their own femininity, social graces and even health. Sydney progressed at school and set her mind to attending Trinity College. She must have been aware of the background hum of the Women’s Suffrage Movement (the Dublin Women’s Suffrage Association was established in 1874) although it was not until 1918 that women aged thirty and over were able to vote. Sydney was one of the first intake of forty women to be admitted to Trinity College, Dublin in the Michaelmas term of 1904 and one of the first to study Experimental Sciences (this included Physics, Chemistry and Mineralogy). It was many years before another woman studied Chemistry. She is credited in G C Duggan’s article as being the first woman to write a protest poem about the great fuss over female clothing. This was bravely written over her initials; one previous poem was written anonymously and posted on the Trinity gates. Her dream was to be an engineer but she knew in her heart that this would not happen in her time, as the doors of the engineering school remained firmly closed to women. The first woman to graduate from TCD Engineering School was in 1972. 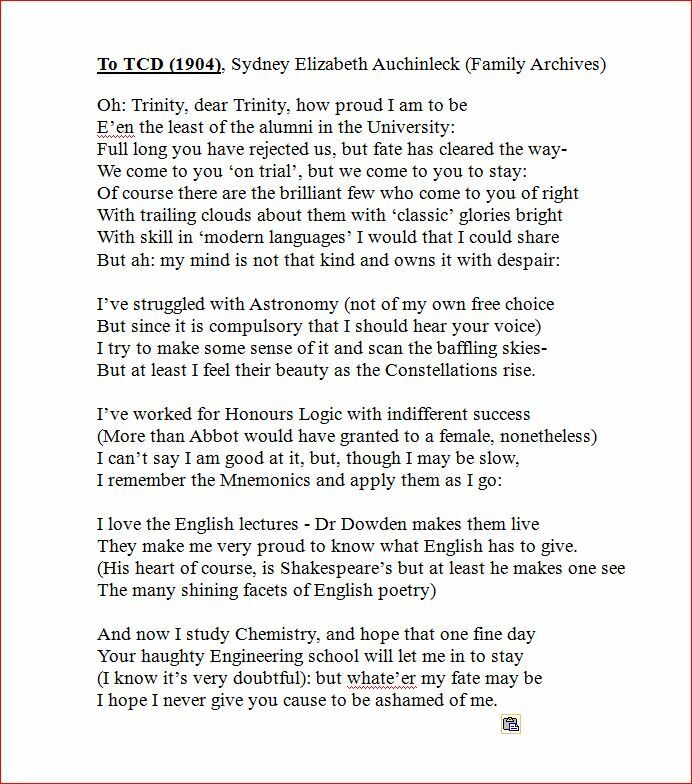 She wrote a rather wistful poem about it in 1904, called To Trinity College, Dublin in which she discussed how she felt about some of the mandatory subjects. In spite of her qualms about Honours Logic, she achieved a second rank Honours in the subject as well as first rank Honours in Literature in the 1906 Hilary term. Sydney and her friend Olive Purser were members of the first committee of the Elizabethan Society which was modelled on the various male societies in the College, which women were not allowed to join. Sydney studied for the Moderator exam, a Moderatorship being a high degree with Honours. Exams had to be passed to show that you were able to sit for a Moderatorship exam, so she did not take an easy route. She achieved her Moderatorship in 1908 about the same time as Norman became a Moderator in Medicine. Sydney remained involved with TCD as a postgraduate, becoming a member of Dublin University Women Graduates Association. In November 2016, a PhD studentship/scholarship in Chemistry called The Trinity and Sydney E Auchinleck Award was announced, starting in 2017.